For a while, I was on the mad search for decent chicken soup I can enjoy at lunchtime. Today, however, I was just content with non-Thanksgiving-esque food items (that logic tanked, please see at end of blog) that I could eat quick today. I never thought I could get exactly what I wanted; it was just a happy, & very delicious accident, thanks to Khao Man Gai. This is my third visit here; the food has always been excellent. Today’s special was Tom Yum chicken soup. It was literally the best soup I’ve had in a long, long time. No kidding. 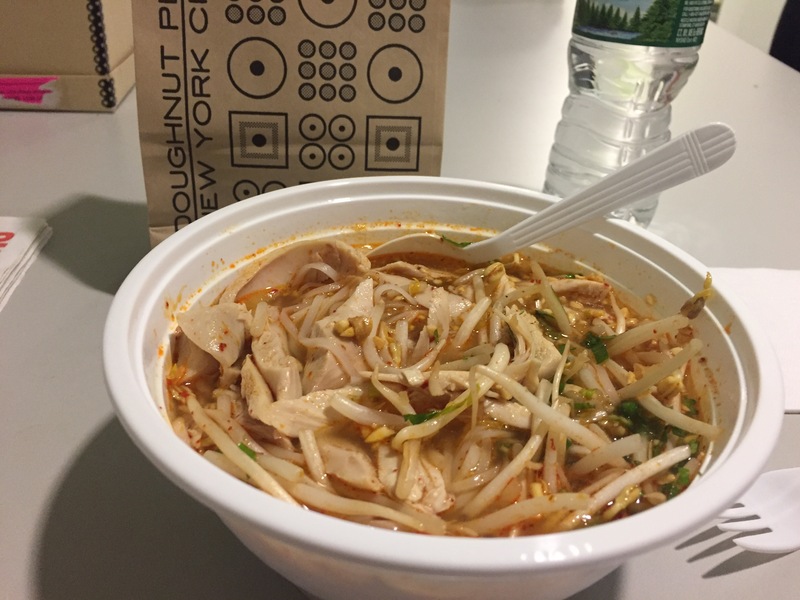 The soup is made with Tom Yum rice noodles, with chicken, peanuts, scallions, bean sprouts, Chinese celery, mint leaves, chili paste and fish broth. Yummy!!!! Thanks to this soup, I feel renewed, optimistic, and favored with lovely flavors. Speaking of flavors, I topped this excellent lunch, with a cranberry-orange cake doughnut from the Doughnut Plant @ Falchi’s. (Thus, the Thanksgiving-esque food item I’ve previously hinted about.) So good!